Israeli engineers left their signature on top of the Tehran Airport when it was built in the 1970s. 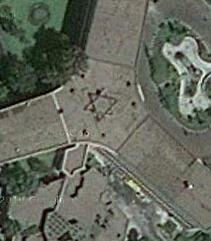 The mullahs were furious to find such on offensive ‘Zionist’ symbol in a Google Earth image. A satellite image of the headquarters of Iran’s national airline reveals a Star of David, and government officials in the Islamic Republic are calling for its immediate removal, according to reports. The satellite image of the Airline of the Islamic Republic of Iran, also known as Iran Air, was taken by Google Earth, according to Ynetnews.com. Local reports say the building was “built by Israeli engineers” who worked in the country before the 1979 Islamic Revolution. “It’s interesting that even 32 years after the victory of the revolution, this Zionist star symbol has yet to be removed from the building,” a local Iranian website wrote, according to Ynetnews.com. The calls to remove the symbol were accompanied by local media reports on Iran’s close relations with Israel prior to the revolution.